The July 2017 PT2026 Firmware update contains an important bug fix for USB operation. All PT2026 users are strongly encouraged to install this update. This is a work-around for a bug in the NI-VISA library, whereby the USBTMC-USB488 driver does not properly handle a response of “Interrupt IN busy” to a ReadStatusByte operation. (A device returns “Interrupt IN busy” when the Interrupt EndPoint FIFO already contains other data, usually a Service Request.) Instead of re-issuing the ReadStatusByte request, the driver continues to wait for a response. As a result, the originating viReadSTB call hangs forever, despite a valid timeout value. Metrolab have seen this intermittent bug for years, and have now finally been able to analyse it to the point of being able to provide a solid work-around. – Separate Installation and Safety Manual (English, German, Spanish, French, Italian). – Concordant reorganisation and update of User's Manual. – Identification of probeThe actual sensor that is placed in the magnetic field. The NMR probe contains the NMR sample; the Hall probe... type. 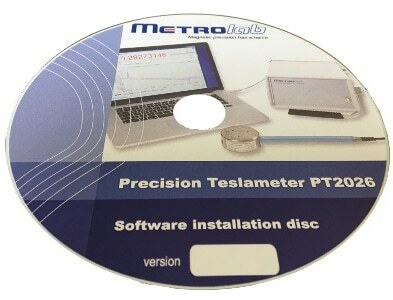 – Measurement status recorded in recording file. – New command to power instrument off. – New command to retrieve firmware debug log. – Bug fixes and optimisation. Note: the firmware, software and (if required) API must all be upgraded together. Download and install the LabVIEW Run-Time Engine 2015 SP1 (32-bit) from the National Instruments web site. Download and install the NI-VISA Run-Time Engine 15.0 from the National Instruments web site. Download and unzip the PT2026 Firmware Upgrade Files Tag_17_07_03. Download, unzip and install the PT2026 Windows Software v1.3. At this point, you should be ready to go! Optionally, if you need it, download the PT2026 LabVIEW Driver v1.5 and unzip it into the \Program Files (x86)\National Instruments\LabVIEW 2015\instr.lib folder. Restart LabVIEW and you should find the PT2026 in the "Instrument IO" palette.